I'm finally having a bit of time to explore some of my images and to reflect on their meaning! Enjoy! Woody and Pat's new beach house! Well house, no beach. Well, not exactly house! A reminder that in Florida there are hurricanes! Woody and I spent an absolutely marvelous day in Cedar Key, Florida! http://www.cedarkey.org/ is the Chamber of Commerce site with directions and good information, but basically it's due west of Ocala, SW of Gainesville, and north of Spring Hill! The Cedar Keyhole Gallery and Artist's Cooperative http://cedarkeyhole.com/ , Haven Isle Gift and Glass Shop, an antique shop that was closed but looked great through the window, and tons of gift shops are divine! We ate at the Seabreeze Restaurant and the view and food were fabulous. Definitely try the Palm Salad with Ice Cream Dressing. It's also on the migratory path of white pelicans, but of course, not right now! I would have loved to have a picture of a white pelican! We drove around and saw some fabulous old houses and a few new ones! The town reminds me of old Florida when I was growing up. The fishing must be great as we saw everything from airboats to kayaks to pontoon boats with fishing equipment. Several guides offered tours and fishing in the "flats" which to landlubbers means that it's really shallow! So no big boats! Driving out to Cedar Key, the land looks a lot like the marsh land of the Carolinas and certainly isn't for beach lovers in the truest sense! 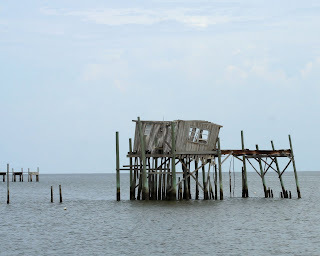 But...if you want to get away to something a bit funky and laid back...I'd recommend Cedar Key! I think we brought rain to Florida! It's still raining every afternoon...I think we're going to have to change lots in the RV park as we flood where we are! Have a great week! We spent the day at Silver Springs and had a great time! It's like old Florida ! I took well over 150 shots and this was the best! I didn't know what I had until I got home and pulled it up on the computer. These monkeys are wild and were put on an island in the early 1920's...the man was going to do tours so people could see the monkeys but he didn't realize they could swim! Currently there are 100's of them and they've gone from Central Florida to Jacksonville , Tampa and points south! This was as we were coming off one of the river tours. 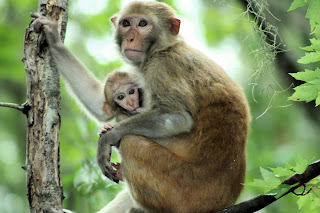 Lunch time with momma monkey! Still selling pictures online so I just keep taking them! We have a black snake here, but I haven't had my camera when he was up and about! I'm becoming quite the naturalist! Finally got my Blue Heron shot!!! Lots of excitement in Ocala! We were hit by lightening on Saturday and lost two major electrical boards! Thankfully it only took out the back air conditioner and electric to the refrigerator. In an RV, you have redundent systems! Our refrigerator is running on propane and the front AC is cooling the back quite nicely! Not a meat locker, but certainly ok even for me! What moron picked Ocala in July? That would be me! It's in the mid 90's and realllly hot! We went to see the new Bruce Willis movie...Live Free or Die Hard...best one ever! It had just a bit of computers for me and lots of mayhem for both of us! We're having a good time, but next year it's Maine in the summer!!!!! Libby and Led went to the race last night in Daytona...they've had a week in Daytona and said they had a blast! It did rain some but didn't seem to bother them. Chris and Jen are at the beach house with Will and Riley. Watched a bit of Wimbledon this weekend and so glad Venus and Roger won! I still love tennis...we have our racquets with us but it's too hot to play! About the only think I do is head to the pool. We're still talking about Disney the end of August...I think we're going to leave the coach here and find a pet friendly hotel...or maybe fly down in November! The boys are having an ok time, but we had to put up sun screens on the front windows of the RV so they are relagated to the side windows because of our position and the sun. We've taken Harley out several times on his leash and he does well until a car or loud people come by and then he heads for home! Better that than running away! He told me he misses Billy Bob. I have an editing job starting tomorrow...it's for the company from Tokyo. We'll see how it goes! Should be a little gas money! I have another one pending, but it's going to be quite complex. We'll see. I work M, Tu, and Fri 9-12 in the office here and then Woody works the afternoons so I should have time to get most of the work done while he's out and about the park! I love retirement! I'm writing a song right now so my haiga's are suffering. I did take a few shots of a cool hawk here in the park but just haven't seen much to shoot as of yet. We are going to Silver Springs on Wed when we're both off...hopefully I'll see some good shots! I need to get some more pictures on Big Stock Photo as my sales are dropping! Busy Busy Busy!!! Woody and Pat are Working! We're here in Ocala, Florida at the Ocala RV Camp and Resort! Our first Workamping job! For the uninitiated, workamping is where we work free and the park gives us a free site for the RV! We work 20 hours a week and don't get paid but the site is worth about $500-900 a month depending on location and time of year! plus no taxes! The fun part is that they needed Woody an additional 10 hours so he gets money!!!! He's making $6.75 an hour!!! He's the pool boy and yesterday was the ant boy! He rode around in the golf cart and put chemicals on ant hills! Some are fire ants so there is much danger! I work in the office but my danger is having to wear green! You know I rarely wear green! I learned a new computer program, Campground Manager! Now I have a skill! That should keep me in the office and in the air conditioning. We got to leave on Sunday thanks to a great mobile RV service! Once we got the battery fixed, we got to a KOA camp in Forsyth, GA in a blinding rain storm on an unlevel lot and the leveling jacks wouldn't work! We found RVMedic, another mobile service in Ocala, and Ray fixed us on the 4th of July! Now I have to struggle with Winnebago to get reimbursed...even if I can't, it's worth it not to have to take this thing and the boys and all my food in the refrig which would spoil, to a dealer and wait to get fixed...I do so love life on the road! Today is the 4th of July and Woody is working and I'm off! This is absolutely wonderful! I slept late...had coffee...checked email...and later, we're going to the pool and cook out! Enjoy your holiday!